"DID they kill him?" Bella thought out loud, waiting after about two hours of Cole being punished for him to return. She brought her knees to her chest and rested her chin against them, as she examined every detail of the closed, chipped, wooden door. "I&apos;m scared," Elliot said quietly, his words muffled into Bella&apos;s sweat-soaked shirt. "I don&apos;t want her to kill me." Bella pouted down at Elliot, before exhaling and leaning her head back against the wall. "Whatever happens," she mumbled, "I&apos;m not going to let them touch us." Elliot stared down at his fingers as he played with them nervously. "Do you see why you can&apos;t make her angry now? You don&apos;t want the big man to hurt you, right?" Bella asked him, her voice stern as she attempted to hide how terrified she was. Elliot didn&apos;t answer, he just continued to gnaw on his nails. "Cole wasn&apos;t nice to her," Bella continued, "and look what happened to him. Well, we don&apos;t even know what happened to him..."
The more she overthought, the more she imagined Cole laying dead on the ground, and the more she worried that she would be next to him soon enough. Elliot&apos;s small shoulders heaved as he took a deep breath. "She must hate when people speak other languages to her." Bella licked her bottom lip, her tired eyes not leaving the door as she continued to rub Elliot&apos;s shoulder comfortingly. The room was silent besides their heavy pants of breath as they struggled to inhale the thick heat of the air. Bella&apos;s hair was drenched and sticking to her face and neck in the most uncomfortable and irritating way, and the skin beneath the chain around her arm was so irritated from sweat and the metal grating against it. Her throat was also intensely dry, aching in desperation for any sort of liquid. The door flew open, and both Bella and Elliot jumped, a small gasp escaping Bella&apos;s lips. Cole was shoved into the room, and Bella couldn&apos;t breathe at the sight of him. Dark red was dripping down his forehead, all the way into his lip. There were intense, vibrant bruises surrounding his eyelids, his cheekbones and lip. His t-shirt had a numerous amount of thin slices scattered around his torso, and blood drenched the outer areas of the fabric as well as his visible skin beneath the clothing. The upper areas of his arms were sliced up as well, thin dark lines of red ran across the base of his triceps and Bella noticed a few similar marks on the sides of his neck as well. The contrast between his paled flesh and the dark purple contusions covering his angular face terrified Bella - he looked close to death. Elliot started crying, but Bella wrapped her free hand around his tear-soaked mouth to silence him. Mommy entered the room behind him, wearing a large trench-coat that drowned her slim frame, and rubber gloves up to her forearms. She grabbed Cole&apos;s arm from the ground and dragged him over to the area against the wall, slumping him against it. "I probably don&apos;t need to chain you up now, do I?" 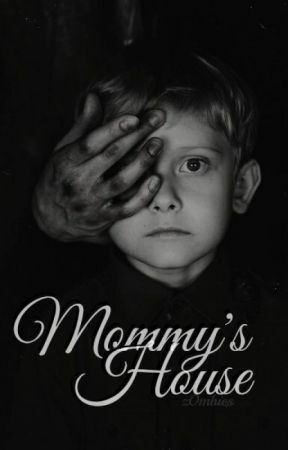 Mommy knelt down, sweeping her finger against a long slash along his neck and collecting his blood. "I get it, I really do. You are a growing boy, and with all those tough-guy hormones, you forget how defenseless you actually are." He sucked air through his teeth in pain as he glared at her with nothing but hatred in his dulled, ashen eyes. "Now you&apos;ll speak English for Mommy, won&apos;t you?" she whispered, an evil grin playing on her cracked, lip-gloss smothered lips. "Yeah, that&apos;s right." Cole&apos;s eyes drooped shut as he continued to ignore the long stream of blood running down his face, neck and arms. "Allow me to clean you up," Mommy offered, reaching into her large pocket and grabbing a half-filled bottle of clear liqueur, holding it up to the flickering light.